Samsung has gone a little bit mad. It has announced the Galaxy A80, which has the most over-engineered selfie camera setup we’ve seen yet. It not only has a slider system, like the Honor Magic 2, but the camera array rotates around as it lifts up, meaning the main camera is used for both regular photos and selfies. If the Galaxy S10 felt a restrained and sensible, the Galaxy A80 shows what Samsung can do when it has had a few drinks. 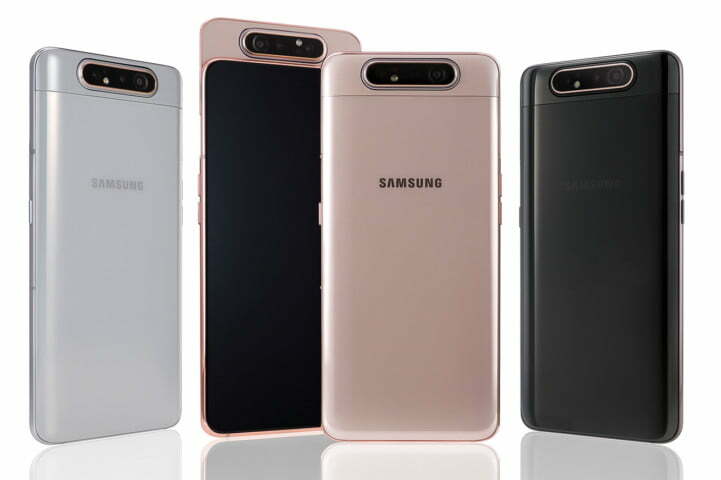 There are three cameras on the Galaxy A80 — a 48-megapixel, f/2.0 main sensor, an 8-megapixel ultra-wide camera lens with a 123-degree field of view, and a 3D depth-sensing camera. The Scene Optimizer artificial intelligence software previously seen on the Galaxy Note 9 and S10 has been included for scene recognition, along with predictive image stabilization for video. Why has Samsung gone crazy with the camera? It’s so the Galaxy A80 has a notch-less, hole-less screen. The Super AMOLED panel is big at 6.7 inches and the borders around the edge are thin. The Galaxy A80 is the first Samsung phone to use its Infinity display technology, one of several new screen types it has detailed recently, including the Infinity-O screen featured on the Galaxy S10. The screen contains the fingerprint sensor inside it, too, rather than it being on the back or side of the phone. Samsung has not named the processor powering the Galaxy A80, but states it’s an octa-core chip, accompanied by 8GB of RAM and 128GB of storage space. A 3,700mAh battery supplies the energy, ready to be topped up using a 25w fast charger. This is a midrange phone from Samsung, despite the innovative camera, yet the body is still made from glass wrapped around a metal frame. It will come in three colors: black, gold, or white. The white and the gold are gradient-style finishes, showing different colors depending on the light and reflection. Samsung will release the Galaxy A80 at the end of May, with the price to be confirmed in the future. Don’t expect it to be cheap — the Galaxy A8 wasn’t — and it’s not known if the phone will be released in the U.S., although a U.K., European, and international release are expected.